5 Pointers for Writing a Letter to Your Customer – StratGo Marketing. Plug-in marketing department services. We all get “letters” from companies we do business with. Most go right in the garbage. But, sometimes, a letter stands out. That was the title of the letter I received after a recent purchase from online retailer KingSize. The one-page communication was a surprisingly good example of customer relationship engagement — that almost didn’t happen. That’s because the envelope and letter felt like just another typical piece of unneeded “junk” mail and I almost threw it out twice before reading the letter. So, what made me read? It was the title of the letter’s author: Brand Manager. That stood out to me as a marketer and former Brand Manager myself. Plus, KingSize offered a $50 discount on my next purchase of at least $100. Intrigued, I researched the Brand Manager to make sure he was real, and not just a marketing fabrication. He is, but David Reinke’s official title is VP, General Manager at FULLBEAUTY Brands, the company that owns the KingSize brand. According to his LinkedIn profile, he leads a 30-person marketing and business team. Okay, the brand seems to be under his remit, so I suppose a bit of creative license is allowed. Thanks for your note and coupon. Nice touch. Chances are I won’t use the discount offer, though. For starters, I’m not a Big & Tall shopper, so I’m not a core KingSize customer. I buy socks from your company because in most cases I can’t walk into a retail store and buy extra large size socks. They’re not stocked. Also, the discount has a short expiration date of 2.5 weeks, and I don’t need anything else from your site now. Still, for a 50% discount, I may take another look, just to be sure. 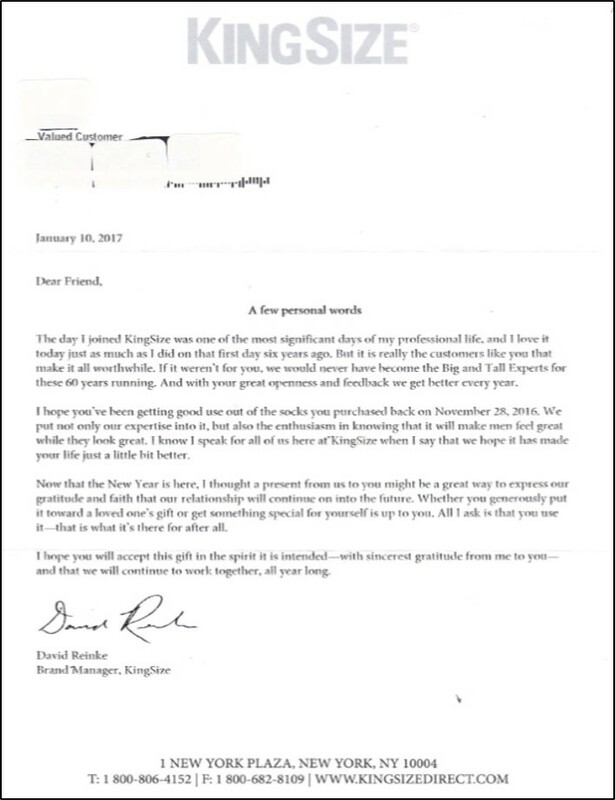 Regardless, I feel just as good, if not a little bit better, about KingSize after your letter. ← Topgolf Provides Marketing Inspiration. Fun Entertainment. And Even Practice If You Want It.